Some of the NFL’s best receivers run a stunning majority of their routes from a slot alignment. The era that pushed every team’s best receiver to the outside is long gone, as coaches now look to exploit mismatches by moving excellent boundary receivers into the slot. Below is a list of the NFL’s five highest-graded receivers that ran at least 200 total routes from a slot alignment during the 2018 regular season. 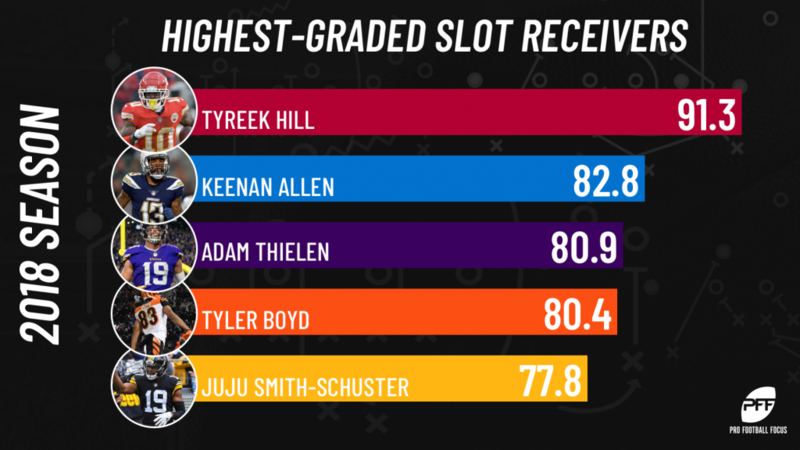 Tyreek Hill was electric from all alignments this past season, recording more than 1,400 yards receiving and 12 touchdowns en route to an impressive 89.0 overall grade on the year. He was at his best, however, away from the boundary and inside the slot, as he recorded a 75.5 receiving grade from an outside alignment and an NFL-high 91.3 receiving grade in the slot. He also led all receivers with 200 or more routes run from the slot in the regular season in yards per route run (3.28); no other qualifying slot receiver averaged more than 2.00 yards per route run from the slot. Hill used his deep speed from the slot better than any other receiver in the NFL. He hauled in 521 receiving yards when targeted 20-plus yards down the field on routes run from a slot alignment, the most we’ve ever charted for a slot receiver in the PFF era (2006-present). Victor Cruz’s 324 deep receiving yards from the slot ranks second on the list. Bolts’ Keenan Allen makes his money in the slot. The 6-foot-2, 211-pound Cal product can do damage on the outside, but he’s truly at his best working from an inside alignment. He caught 68-of-86 targets for 712 yards, 31 first downs and seven touchdowns from the slot this past season, ranking third in yards per route run (1.98) and second in completion percentage when targeted (81.0%). Allen’s top routes from a slot alignment were outs, ins and crossing routes, as he caught 40-of-54 targets for 656 yards on such routes last year. Creating separation underneath zone coverage and picking up yards after the catch was truly his bread and butter. He averaged 2.52 yards per route run when he was targeted nine or fewer yards down the field, ranking second among qualifying slot receivers. Adam Thielen’s hot start to the season didn’t run its course through the end of the year, but he still put together a top-three performance from the slot in 2018. He averaged a whopping 1.91 yards per route run and earned a 118.6 passer rating when targeted on the year, both figures ranking inside the top 10 among qualifying slot receivers. Thielen was truly a machine when it came to moving the chains, as he ranked second in the NFL in combined first downs and touchdowns (38) from the slot. He also finished second in slot touchdowns (7), behind Hill. Tyler Boyd’s breakout year with the Bengals was largely tied to his increased efficiency in the slot. He ranked second behind Hill in yards per route run at 2.00 and ranked eighth in passer rating when targeted (113.9) from the slot in 2018. Boyd was specifically remarkable on third and fourth down, as his 84.6 receiving grade on such downs ranked second among receivers with at least 50 routes run in the slot on third or fourth down. He caught 20-of-36 targets for 14 first downs and two touchdowns from an inside alignment on the two money downs a year ago. JuJu Smith-Schuster ran a whopping 421 routes from the slot in 2018, which tied for fourth in the NFL with primary slot receiver Cole Beasley. He may take on a bigger role outside in 2019 with his former teammate Antonio Brown now suiting up for Jon Gruden in Oakland, but his efficiency in the slot will keep him from transitioning to the boundary completely. Smith-Schuster ranked third in combined first downs and touchdowns (37), fifth in yards per route run (1.93) and first in total yards after the catch (384) from a slot alignment in 2018.